These free printable frames and borders are ideal for using to make quick handmade cards, adding to scrapbook pages or using in other papercraft projects. Add a rubber stamped or digital stamp image to the inside of the frame to create a quick card. These frames are saved at a high resolution, therefore you will be able to use your printer to make larger images if required to create frames and borders for scrapbook pages. 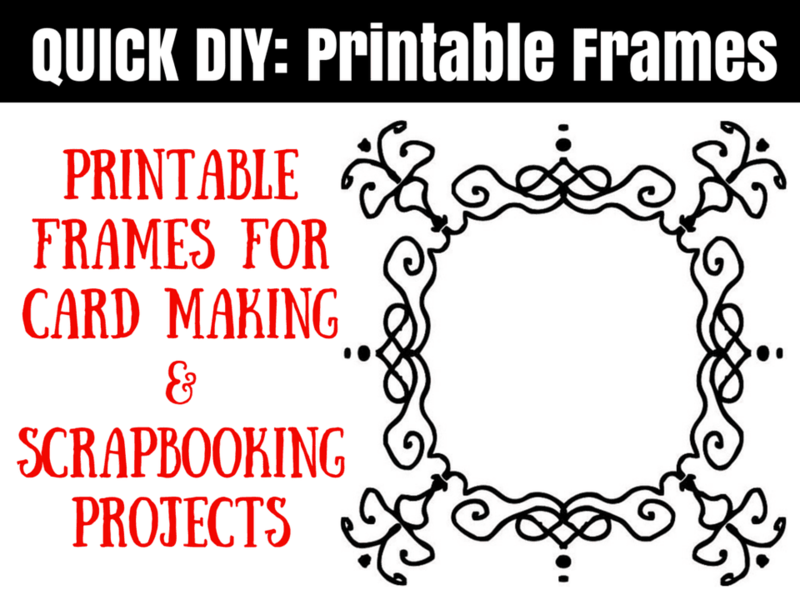 Download these borders and frames and add rubber stamps or other images as required. For more information about using free printable frames and borders check out this guide - How to Use Printable Frames and Borders. Here's an ornate black and white frame which will be a great finishing touch to your handmade card or scrapbook page. This black and white flower frame can be colored and used for many occasions. Color the flowers with marker pens for a bold and cheerful finish. This heart frame features a ring of hearts. Color the hearts in pinks and reds for a traditional romantic card or try something different for a contemporary twist. The tiny flowers which form this frame look lovely colored in light mauves or purples. Alternatively pick a color from your central stamp or photo to finish the frame. This holly frame is ideal for Christmas and holidays cards and projects. Add some glitter to the holly berries to catch the light and add some sparkle. These Halloween frames are perfect for your Halloween invitations and cards. Resize the frames on your printer to make larger or smaller frames as required. You will find a range of different Halloween themed frames for you to download. Tip: Small frames make great embellishments for cards. You will find a range of different frames to make holiday and Christmas cards in a range of styles.